Here’s the first of what I hope will be loads of posts on Alsace Wine Travel. I’m in the process of updating my Alsace sections for Wine Travel Guides, a pleasurable task that I fit in around general writing, travel and food assignments and one that will be spilling out onto these pages. To explain the WTG approach: for each of the three Alsace micro-regions, I select 12 growers to profile. Updates are a chance to refresh my selections, so each year a few drop out of the mix and new ones step into their place. I’ve tasted Paul Blanck wines on a number of occasions, including at Thierry Meyer’s Oenoalsace dinners, but never visited. Today was the day. 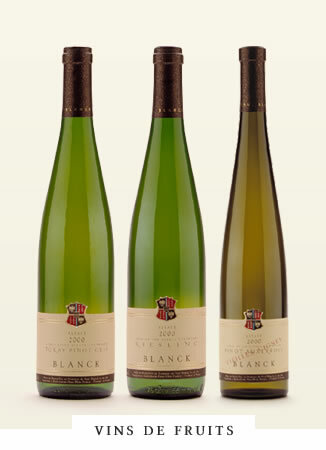 Domaine Paul Blanck is a 35-ha estate producing approximately 230,000 bottles a year, of which an astonishing 80% is exported – the US and Benelux are faithful clients. They grow the usual 6 Alsace white grape varieties (riesling, Pinot Gris, Gewurz, Muscat, Pinot Blanc & Sylvaner), plus Chasselas, and some Pinot Noir. Their vineyards are scattered around 5 different Grands Crus – Furstentum, Schlossberg, Wineck-Schlossberg, Sommerberg and Mambourg – and they also own a whole slew of lieux-dits in and around Kientzheim. The estate is run nowadays by Paul Blanck’s two grandsons, Frédéric, the wine maker, and Philippe, responsible for sales and marketing . The property, snugly ensconced inside the medieval walls of the picturesque village of Kientzheim (home of the Confrérie de Saint Etienne, Alsace’s wine fraternity) is clearly marked and their sign said ouvert but repeated pealings on the doorbell drew a blan[c]k. Finally we raised someone and stumbled down into the cellar, grateful to take refuge from the March snow flurries. The slightly gloomy and cobwebby nether regions come as a huge surprise after the slick professionalism of their website, www.blanck.com. But while the cellar and tasting space may be a little dusty, the wines fairly sparkle. We started with an ’09 Auxerrois (aka Pinot Blanc, at the more aromatic end of the spectrum), fragrant and bone-dry, progressing to their entry level Riesling ’11, lightly fruity, not especially typé, crisp and green apple-y. Staying with the Riesling theme we tried a Rosenbourg ’09 (more petrolly, also crisp and bone-dry), a GC Sommerberg ’08 (gorgeous, grapefruit) and a GC Furstentum ’05 (marked petrol aromas, more minerality, less citrus). Next up came a couple of Pinot Gris, first a 2010 Patergarten, a lieu-dit just south of the village that runs right up against neighbouring Kaysersberg (recognisably PG, perfect balance sugar/acidity), followed by a GC Furstentum ’09, which was richer, more complex, with perceptibly more residual sugar. Then came two Gewurzes, Altenbourg ’07 (understated Gewurz character, lovely spicy finish) and GC Mambourg ’07 (as expected, more flesh and sinews – and natural sweetness – than the Altenbourg). We wrapped it up with two Pinot Noirs, the entry-level classique 2011, light, fresh (a bit too chilled), a little green and a Pinot Noir ‘F’ ’08, grown in Grand Cru Furstentum but not entitled to call itself a GC because not one of the officially permitted varieties – pale garnet, bitter almonds, a good mouthful, some length (has had a spell en barrique) – but IMHO the €19 they’re asking for it might be better invested in a Baden Spätburgunder from across the Rhine (Dr Heger, Becker, Johner et al). A domaine that’s definitely worth a visit and I’ll be recommending them on the WTG site. They’re wonderfully welcoming and full of enthusiasm for their work, their wines and their region. They note on their site that “aucune obligation d’achat n’est requise” (no obligation to buy) – which is generous, considering that at the drop of a hat they will uncork a wide range, from young, generic wines right through to Grands Crus raised at a leisurely pace and given yet more ageing in bottle: you can always find older vintages still for sale here (currently wines from 2005 to 2011 listed). Prices are reasonable for the quality offered, and we happily invested in some Pinot Gris Patergarten (€12) and Gewurz Altenbourg (€13).